Probashbangla24 online Desk : Myanmar is defending itself against a United Nations report released in August which accused the Southeast Asian country of committing genocide against the Rohingya. The official accused Bangladesh, which is hosting over a million Rohingya refugees, of failing to repatriate them to Myanmar based on three agreements the countries have signed. Bangladeshi President Sheikh Hasina had accused Myanmar Thursday at her U.N. speech of failing to honor a verbal commitment to take back Rohingya Muslims who have fled a crackdown she described as tantamount to genocide. Cambodia’s longtime prime minister has taken aim at unilateralism and ‘protectionist policy,’ saying they cause problems in the attempts to cultivate healthy economies and relations. Hun Sen’s comments seemed aimed at the United States, which has recently taken both positions publicly and imposed tough tariffs on China — and slapped some sanctions on Cambodia as well. Lavrov also said U.S.-Russian working groups on counter-terrorism and cyber-security are on hold as is a critical dialogue on strategic stability. Lavrov made the remarks hours after addressing world leaders at the United Nation’s annual General Assembly. Lavrov used Russia’s speech to vigorously defend multilateral organizations like the United Nations and warn against unilateral moves by the U.S. or other countries. Iraq’s top diplomat has thanked the international community and the United Nations for its help in fighting the Islamic State over the past four years. The lawyer representing two Reuters journalists imprisoned in Myanmar for what critics say was merely doing their jobs is urging the government of Nobel Peace laureate Aung San Suu Kyi to undo ‘a miscarriage of justice’ by immediately pardoning them. Human rights attorney Amal Clooney noted to an audience at the United Nations that Suu Kyi was a victim of wrongful imprisonment and said history will judge her on whether she grants the request for a pardon by the families of reporters Wa Lone and Kyaw Soe Oo. They were sentenced to seven years in prison. Clooney says the request for a pardon isn’t an admission of guilt and is calling for Myanmar’s government to admit that no crime was committed. Critics say the Reuters reporters were imprisoned because the government wanted to prevent the news agency from publishing their story on the extrajudicial killings of 10 Rohingya Muslim men and boys. German Foreign Minister Heiko Maas says the crisis in multilateral diplomacy can be resolved, citing his own country’s history following the defeat of Nazism. Maas told the U.N. General Assembly on Friday that ‘our European neighbors’ courage in seeking reconciliation’ and the help of the United States put a scarred continent on a path to freedom, security and prosperity after World War II. He added that ‘in a world faced with immense global problems, we can only safeguard sovereignty if we work together’ on issues such as climate change and the conflict in Syria. The prime minister of Fiji says his nation is losing patience with world leaders who voice concern over climate change ‘and then do little or nothing’ to reduce their nations’ greenhouse gas emissions. Voreqe Bainimarama told the U.N. General Assembly on Friday that the world risks missing its target of keeping global warming well below 2 degrees Celsius (3.6 degrees Fahrenheit) as set out in the 2015 Paris climate accord. Russian Foreign Minister Sergey Lavrov says Moscow will do ‘everything possible’ to preserve the 2015 accord on curbing curb Iran’s nuclear program despite the U.S. withdrawal. Speaking to the U.N. General Assembly on Friday, Lavrov denounced U.S. President Donald Trump’s decision to pull out of the deal and called it part of a dangerous trend of unilateral measure that risk damaging the post-World War II global order. He called the U.S. move a violation of U.N. resolutions and a threat to stability in the Mideast. Lavrov met this week with Iran’s foreign minister and other signatories to the 2015 deal. Russian Foreign Minister Sergey Lavrov is denouncing what he says are ‘baseless accusations’ of Russian interference in foreign affairs and lashing out at U.S. policies in Iran, Syria and Venezuela. Lavrov used Russia’s speech at the annual U.N. General Assembly to vigorously defend multilateral organizations like the United Nations and warn against unilateral moves by the U.S. or other countries. Lavrov accused unnamed forces of ‘endeavors to undermine democratically elected governments,’ in an apparent reference to U.S. and EU support for Russia’s neighbors and the Syrian opposition. Russia has denied widespread evidence tying it to meddling in the 2016 U.S. election, a nerve agent attack in Britain and other actions abroad. Greece is using its address to world leaders to chastise some European neighbors for turning their backs on migrants who continue to pour into Europe by land and by sea. Most migrants land in Italy and Greece and those countries feel abandoned by their EU partners. Member states like Hungary, Poland, the Czech Republic and Slovakia are unwilling to share the burden and refuse to accept refugee quotas. Malaysian Prime Minister Mahathir Mohamad is criticizing growing political, economic and social turmoil around the world, saying the situation has only worsened since the start of the century. And he criticizes the government of Myanmar for its treatment of its Rohingya Muslim minority and accuses the rest of the world of failing to act. The U.N.’s deputy humanitarian chief says Myanmar hasn’t ‘substantively and concretely’ addressed the issues that led more than 725,000 Rohingya Muslims to flee, and therefore conditions aren’t right for their repatriation from Bangladesh. 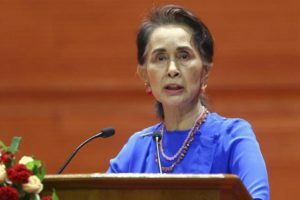 In her speech, circulated Friday, Mueller said the Rohingya are now ‘the world’s largest stateless population.’ She urged donors to respond to the refugee crisis, stressing that the appeal for Bangladesh is only 38 percent funded. Mueller also urged Myanmar’s government to dismantle segregated facilities for the roughly 600,000 Rohingya who remain in Myanmar and end the marginalization and ‘deplorable conditions’ many are forced to live in. China’s foreign minister says ‘now is a crucial time’ for the implementation of a deal with Iran to prevent that country from developing nuclear weapons in return for the lifting of sanctions. Wang Yi told the U.N. General Assembly on Friday that the 2015 deal was endorsed at the time by the global body’s powerful Security Council. The administration of U.S. President Donald Trump has since yanked its support for the deal and is re-imposing sanctions on Tehran. He warns that if the deal isn’t implemented, ‘the international nuclear non-proliferation regime will be undermined’ and the authority of the Security Council will be challenged. He told the U.N. Security Council that China has worked to contribute its part to improve relations between North Korea and South Korea, as well as efforts to facilitate dialogue between Pyongyang and the United States. China’s Foreign Minister Wang Yi says relations between nations should be ‘based on credibility, not on willful revocation of commitment’ as his country and the United State remain locked in a dispute over trade. He stressed Beijing’s commitment to multilateralism, adding that ‘unilateral moves will bring damage to all’, a reference to resolving disputes within the framework of the World Trade Organization. Two of Macedonia’s closest neighbors are welcoming the country’s upcoming referendum on changing its name. Bulgaria’s Prime Minister Boyko Borissov told the U.N. General Assembly on Friday that the agreement between Greece and Macedonia to resolve their long-standing dispute over the name is an example of a ‘new spirit’ between countries in the region. Civil war-torn South Sudan is calling on the international community, ‘including those who are skeptical, to give peace a chance’ as the latest agreement to end the conflict moves forward. First Vice President Taban Deng Gai told the U.N. gathering of world leaders Friday that the East African country is on schedule to hold ‘free and fair’ general elections after a 36-month transition period under the new agreement. The United States and others are wary of this latest deal, which returns rebel leader Riek Machar as President Salva Kiir’s deputy. Fighting between their supporters sparked the civil war in late 2013. A new report this week gave a striking new estimate of the conflict’s toll: 382,900 deaths, with roughly half blamed on violence and many others on disease. ‘As brothers and sisters we have hurt each other,’ the first vice president told the U.N.
Moscow is expected to use its address to world leaders to enshrine Russia as a counterweight to U.S. influence in areas from the Mideast to Venezuela and the Korean peninsula. Russian Foreign Minister Sergey Lavrov has held a flurry of bilateral meetings at the United Nations this week and has loudly defended Russia’s strategies in meetings at the Security Council. Syria has been Russia’s running theme, as Moscow seeks to manage the end of the civil war and ensure a long-term foothold in the region. Russia is Syrian President Bashar Assad’s longtime patron and wants Western financing for Syria’s reconstruction while maintaining the upper hand in discussions on Syria’s political future. The two countries that the United States has accused of interfering with its elections are taking take their turns at the podium at the United Nations’ annual gathering of world leaders. Major powers China and Russia — neither of which sent their most senior leader to the U.N. General Assembly — will put forth their foreign ministers to tell their stories.